A drill press is used by many woodworkers around the globe for its efficiency in perfect woodworking. Drilling can be done by placing the drill press on a table or larger models on the floor. It includes a steel column which connects the base to the top of the base. Here, the motor powering the chuck. It holds the bit is located. One of its best conveniences is the drill woodworking operates using a geared mechanism unlike a hand drill machine. As a result, you can use the lever to rise or descend the bit. Before you start your drill woodworking, it is necessary to know that the piece which is going to be attached should be kept on the table that is adjusted with the vertical column. Drill press offers another advantage that you can drill exactly straight or at an angle. You will be able to constantly drill in the same location with the help of a fence and stop block. Drill woodworking needs correct measurements to secure its drilling location. You can buy drill guides from hardware stores or building supply centers. These can be available in a wide range of diameters. Place it on the surface of the work and insert the bit through the guide to drill like a professional. A drill press can solve your issue related to drilling guides. You can make a set of drill guides by your own by drilling different diameter holes in blocks of wood. But be careful while doing this as the holes in the wooden guide can differ from that of drill guides. Large holes may make it more difficult to position the drill. To align the bit, you should remove a square or rectangle of wood from a board. Then make a right angle with it and place the bit into a corner. Thus, a perfect alignment will be created. As you align the bit with the nail by touch, you should put a large-headed nail before with the head down on the surface of the board. Another trick that will keep your hole straight and perpendicular is by using an empty spool of thread or sewing machine bobbin. First, you have to mark the spot by making a start hole. You can mark with nail or ice pick. Now, the spool or bobbin should be kept in a place that the drill bit passes through it and then align the point with the start hole that was created by you before. Keep the flat end of the spool or bobbin securely with the drill in the ‘off’ position. Hold it against the surface and in place with pliers. Now, with this position, you can start the drill, and you will observe the hole will be drilled in a perfectly straight or perpendicular way. These are few simple guides you can consider before starting a woodworking project with a drill press. 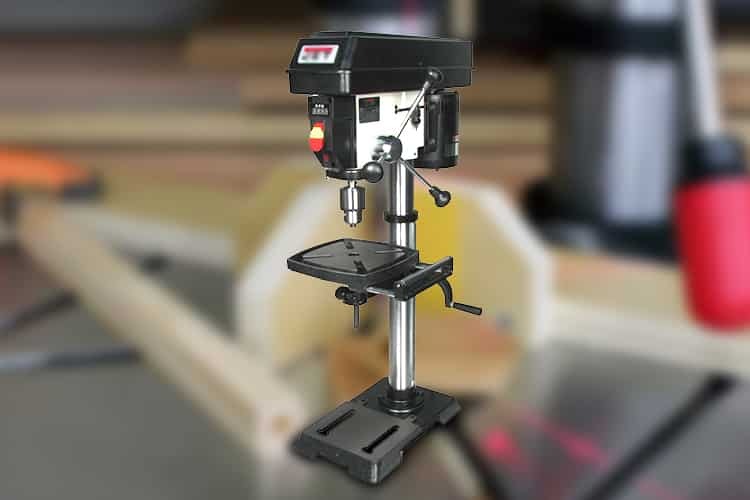 Also, you may spend some time choosing a great one from the popular drill presses We hope the instructions will be helpful for you to drill holes flawlessly. Send us a question if you still have a question!